Home>Blog>Smart Pots And Air Pots: What Are They And What's The Difference? Smart Pots, Air Pots, Spring Pots, and the numerous variations on this theme all work in a similar manner. That is, they let air in through the side of the pot, which promotes air pruning of the apically dominant root tips. This in turn makes the root diverge in two different directions, and eventually, a dendritic pattern appears. When the perimeter roots are pruned by the air, their growth slows prior to the new shoots developing. In this time, the plant responds by increasing root growth everywhere else in the root ball. Plants that have been grown in an air pruning pot not only have a complex outer root pattern, they also have larger and denser root balls in general. This equates to more surface area for gas exchange and water and nutrient uptake, while providing more stability for plants. Another benefit of pots that encourage air pruning is that they prevent roots from winding around the sides of the pot and eventually strangling themselves in a knot. This can promote every cannabis farmer’s worst nightmare, Pythium or root rot. It can also subject the plants to unnecessary root stress from overheating. When roots hug the pot walls, they come into contact with a very hot surface. Especially on the sunward surfaces. Plastic pots tend to heat up considerably, transferring the heat to the grow medium. When a grow medium heats up too much, plants can display many symptoms of stress in the growth patterns and leaves. These include over and underfeeding simultaneously, cupping and canoeing of leaves, and many symptoms attributed to pathogens and bug infestations. Overheated grow media can have growers chasing their tails trying to sort out problems that don’t really exist. Air pruning pots keep the growing medium at a manageable temperature. The permeable surfaces expose water to the air, encouraging evaporation. This in turn cools the pot walls, which then help keep the grow medium cooler. Combined with mulching, air pruning pots make plants more resilient to heat stress in general. These types of pots also give the root zone access to plenty of air. Roots, not just leaves, need air as well to remain healthy. Not only do roots need to breathe; a robust oxygen exchange helps keep pathogens at bay. A friable and well-structured grow medium allows plenty of air to move about in the root zone. 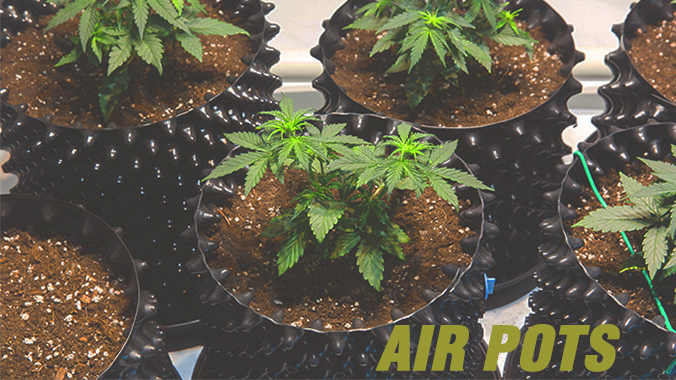 Air pruning pots allow plenty of air to not only trim roots, but to permeate the entire grow medium. Plants can draw in air from 360°, rather than only relying on air available at the surface. Traditional pots in comparison only have minimal ability to promote efficient air movement. Air Pots are made from a perforated and uniquely profiled plastic sheet that is rolled into a cylinder to form a pot. A perforated base is held in place when the pot is rolled, and is located a few centimetres from the bottom. This lets water freely drain right through and encourages airflow around the bottom of the pot. The profiled surfaces train roots to grow towards perforated air holes where they are air-pruned. The air holes are also an escape zone for water, which evaporates and keeps the pots cool. The nature of the pot means larger plants can be grown in smaller pots with less grow medium. This makes them more cost-efficient for the same results, and allows more plants per square metre of available space. There are a range of pot sizes, and the material from which they are made is available in custom-sized rolls. This way, large pots can be made in situ, of any capacity, and up to a metre deep. 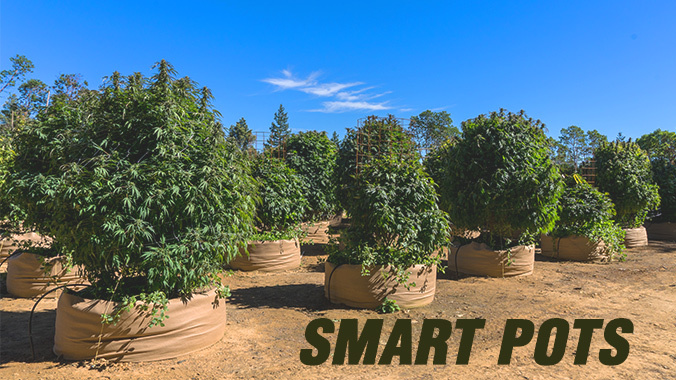 Smart Pots are made from a dense fabric that has been used for decades for a number of other purposes in the horticultural industry. The fabric is sewn into pots with bottoms made from the same material. They come in various sizes, from only a few litres right up to 4,000 litres. People are surprised to hear they have been around for over forty years, especially in the tree-growing industry. The fabric from which they are made allows 100% exposure to the air over the whole surface of the pot. Roots grow as they please and are air-pruned when they reach the air layer between the pot and the grow medium. WHAT IS A SPRING POT? 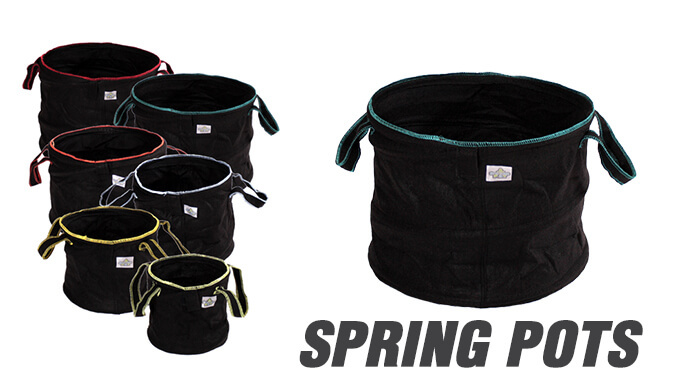 The Spring Pot addresses one issue associated with fabric pots—their lack of rigidity. The Spring Pot functions as any other fabric pot, only it has a built-in spring that encircles the pot, giving it a firmer structure. After the pot has been used, it can be collapsed so it takes up minimal storage space. They come in a variety of sizes and have sturdy handles for easy moving about. 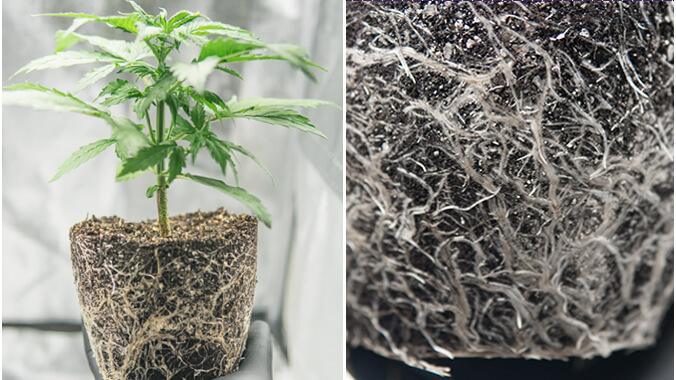 When root zones from each type of pot are examined, it is easy to discern the differences and similarities in root growth. There is a definite geometric pattern to Air Pots. It is easy to see where the roots diverge, then diverge again after they have been air-pruned. Smart Pots and other fabric pots have less of an organised appearance, and the roots are more randomly spaced and patterned. However, it is again easy to discern the divergences in the roots where they have been air-pruned.